When David Lynch began filming The Grandmother he was still a painter exploring the possibilities of film rather than a filmmaker per se. 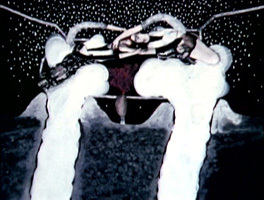 His previous shorts, Six Figures Getting Sick (1966) and The Alphabet (1968) last under five minutes in total, and the former was part of a mixed-media installation included in a gallery show. The Grandmother, then, is Lynch’s first major film in terms of length, style, and choice of material. Describing the events of the film elicits more questions than answers, and this seems to be part of its design. The story of the film is something along these lines. Mom and Dad wriggle up from the ground. They rut like animals, and their Boy is born from the ground in much the same way as they were. The Boy is neither understood nor loved, and his dog-like parents bark his name at him: Mutt! The Boy is incontinent, and his father beats him for it, rubbing the unfortunate child’s face in the bright yellow stain on the bed. Unhappy, the Boy finds a seed, plants it on a bed, waters, waits, and a Grandmother sprouts out to love and comfort him. At a particularly difficult family dinner the Boy flees his enraged drunken father and goes to the Grandmother’s welcoming embrace. He fantasises about executing his parents by crushing them. He and the Grandmother spend some time poking each other with their index fingers, then she enables him to grow into some kind of dribbling cartoon flower. Sadly, the Grandmother whistles herself to death, and the Boy is despondent. The last image is troubling and difficult to describe, suggesting the Boy has somehow killed himself. Of course this description says almost nothing about the experience of watching the film. Lynch’s films have often been compared to dreams, and The Grandmother doesn’t do anything to disprove that reading. There is no dialogue, save the word “Mutt” grunted by the parents. There seems to be a law of cause and effect at work here, but the mechanisms by which the causes lead to the effects is obscured. For example, consider the scene after the Boy “kills” his parents. There is a cut to the bed, it fills with yellow paint until it overflows the room. The next shot shows what seems to be some kind of animated aquifer filling with yellow liquid; next, a long white plank, and the animated Boy falling off it, into the urine aquifer, splashing out yellow clouds; next, hoses puff up the animated father and mother until rods burst them. These things follow one another, certainly, but not because anyone ever expected them to. And their enigmatic presentation – the reduction of parent-child relationships to simple gestures, juxtapositions of bodies and understated movements – has led some to indulge in Freudian analyses of the film, writing about symbolic Father-killings and the Mother’s embrace and rejection of the Boy in terms of Oedipal Complexes, and so on. To be sure, these images do convey some kind of primitive emotion. It is murky and hard-to-define, but it is there, accomplished through the images rather than through dialogue or some chamber-room drama. As such, one might first let the images and sounds of this presentation flow over him or her, and not work terribly hard to assign logic or “meaning” to any of the proceedings. Lynch claims his interest in film stems from the desire to see his paintings move (1), and The Grandmother is full of painterly qualities and concerns, particularly in the use of a reduced colour palette. The walls and furniture are painted black, and the Boy is dressed in a black and white tuxedo. All of the actors wear pancake make-up, with only a trace of red lipstick on the mouth. When Mom and Dad are onscreen Lynch includes green and red in the frame – both on Mom’s dress and on the furniture of the dining room. There is more colour contrast in scenes which show a bright blue sky with the yellow sun and moon. This yellow colour acts as a visual accent in the Boy’s bedroom, where the bright stain on the bed sheets is the central focus. Black-and-white footage, with its greatest possible colour reduction, is interspersed, most notably in the death of the Grandmother. A possible visual antecedent for the film could be Francis Bacon, whose 1954 painting “Figure with Meat” has precisely the same black background, limned with white, as The Grandmother’s set. And the shots of Lynch’s Boy, in the midst of being punished, frozen in time, his mouth an open, dark hole, screaming for entirely too long, recall Bacon’s “Screaming Pope” (1952). Precedents for Lynch’s filmmaking choices include, perhaps, the pixilated people of Norman McLaren’s Neighbours (1952), the cryptic, cabalistic cut-outs of Harry Smith’s Heaven and Earth Magic (1962), and Maya Deren’s dreamlike Meshes in the Afternoon (1943). It’s reasonable to suspect the young art student Lynch attended these films with interest, as they would have been readily available and part of most art-school curricula at the time. The Grandmother is also Lynch’s first collaboration with Alan Splet, his sound designer through to Blue Velvet (1986). Splet’s sound design adds to the dreamlike quality of the film. Some sounds synch to on-screen activities (voices, the rustling of leaves), but there are far more purely atmospheric sounds – such as hisses and rhythmic noises, gloomy German-influenced electronic music (2). Even Lynch’s latest features, Lost Highway (1997) and Mulholland Dr. (2001), show the same tendency to abandon classic storytelling guidelines and formulas in favour of a visual, sonic, emotional climax. The most remarkable moments in his films are the ones in which the viewer is somehow panicked and uneasy, carried along by the sounds and pictures that cannot be easily described. But the feeling remains, and the experience is unforgettable. This comment, and others, are derived from the interviews contained on the most recent DVD of Lynch’s shorts, available from his own website. As of 2002, which is admittedly some time later than The Grandmother’s production schedule, Lynch still seems unable to put any of the motivations and artistic underpinnings of any of his projects into words. For that we are relieved; if he were able, he would probably write essays and not make films. It is particularly helpful to think of bands like Kraftwerk, Neu!, Faust and Cluster as comparisons. Lynch credits his soundtrack to “Tractor”. No information is available about this group, and a likely speculation is that it is really Lynch and Splet.